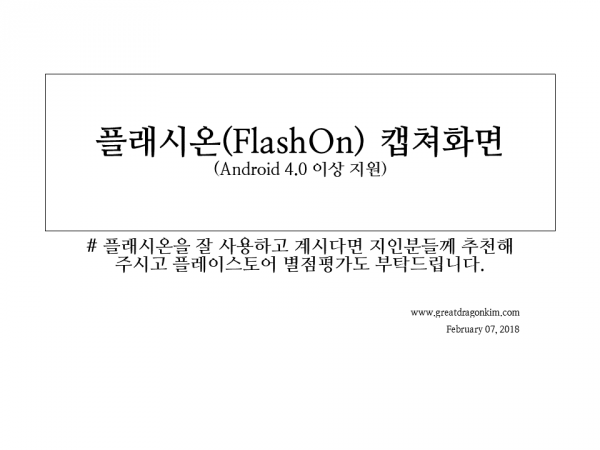 FlashOn functions to turn the flash on and off. We do not use personal information and it is safe. 1. When you run the FlashOn, the flash will turn on. 2. Click the central incandescent icon to turn the flash on or off. 3. Click the icon when it is off to turn on the flash. 4. When on, click the icon to turn off the flash. 5. 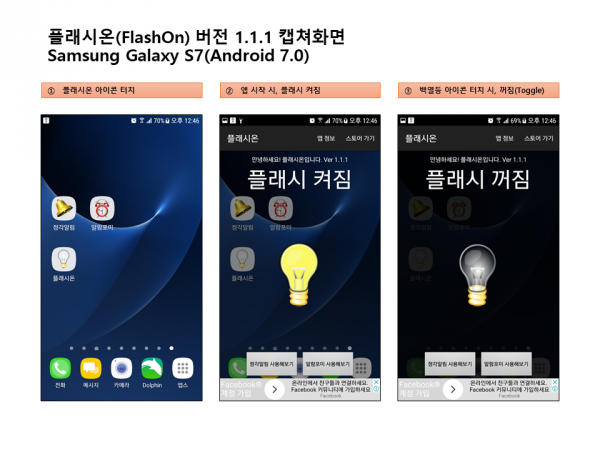 The flash will turn on during the initial app startup. 플래시온은 플래시를 켜고 끄는 기능을 수행합니다. 1. 플래시온 앱을 실행하면 플래시가 켜집니다. 2. 중앙의 백열등 아이콘을 클릭하면 플래시 켜지거나 꺼집니다. 3. 꺼져있을 때 아이콘을 클릭하면 플래시가 켜집니다. 4. 켜져있을 때 아이콘을 클릭하면 플래시가 꺼집니다. 5. 초기 앱 시작시에는 플래시가 켜집니다.